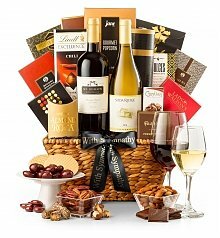 Celebrate a special birthday with our impressive wine gift baskets and gifts. 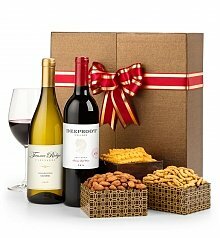 The gift of fine wine and gourmet food is a present that everyone enjoys receiving. 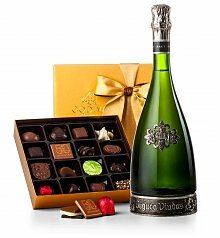 Imagine the look of joy your recipient will have when opening package after package of gourmet delicacies! 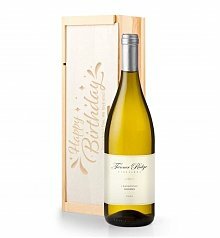 We include a variety of choice vintages in our birthday wine gift baskets for an impressive and memorable presentation. 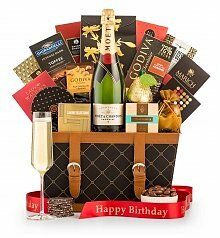 Each of the birthday gift baskets we offer is individually themed and composed, which makes it easy to find tailored or appropriate products when searching for unique birthday ideas or for that hard-to-buy-for person. 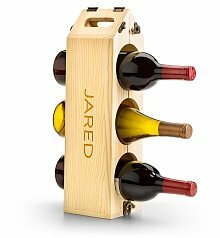 Birthday wine gift baskets are dramatic enough to be sent on their own, but supplementary gifts are always a good idea. Some customers send birthday flowers for an added touch of elegance and many people send birthday balloon bouquets when a sense of festivity is desired. 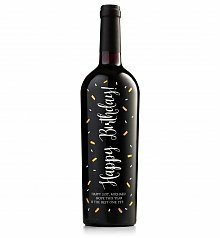 Whatever you choose, you will have already made their birthday a special event full of new flavors and sensations by having sent one of our luxurious birthday wine gift baskets. 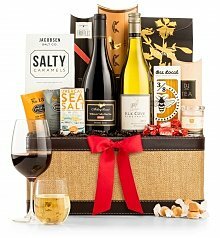 What Is in Our Gift Baskets? We include a spectrum of delicacies and confections in our birthday fruit baskets as well as our gourmet wine baskets. Some of our ensembles are on the sweet side with products such as caramels, Almond Roca, and lemon tea cookies. Other collections are full of zest and include foods like hot seasoned almonds, chipotle and lime popcorn, and spicy Guadalajara mix. There is something in our birthday gifts selection to satisfy every palette.